Today’s Fattoush -Crumbled Pita Chip Salad recipe is one of my all-time favourite salads. I eat this at least 3 times a week through the cold winter months when everything is white and all I’m craving is green. With its crisp romaine lettuce, cucumbers, and tomatoes flecked with fresh herbs, crumbled pita chips, and a fresh-bomb garlic, lemon, and za’atar dressing, Fattoush -Crumbled Pita Salad lifts that winter dreariness for at least as long as I munch the salad. I hope you enjoy it as much as we do! It’s salad time! And crouton time! I have a two-fer for you on this glorious day. How much do you love salad this time of year? Maybe I should rephrase that. How much do I love salad this time of year? I’m nutty nuts over it. I’m a definite crouton girl, too, so today is extra fun for me. 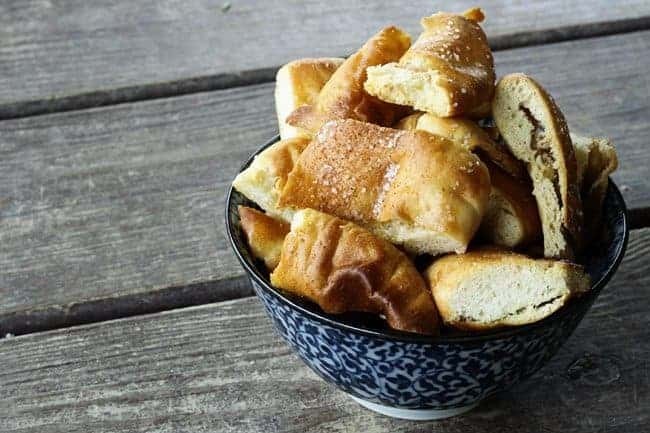 The Pita crisps serve as some world-class croutons, to be sure, but they’re also PERFECT for dipping into the summer standard hummus or whatever dunkable goodies you like best. Do you love pita chips, too? I’m a little bonkers over them personally. They’re in the Bagel Chip category for the guys and me. I hear people crunching and munching on them from the moment the pan comes out of the oven until I hear hands swishing around for whatever leftover crumbs are rattling around at the bottom of the jar. When I get a fresh batch of pita chips out of the oven, my first order of business is to set aside enough to make a massive batch of Fattoush. 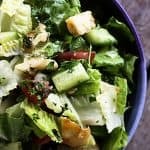 Fattoush -for those of you who aren’t lucky enough to live where there is great Lebanese food available- is my favourite summer salad by a mile and a half. Crisp Romaine lettuce is the base for this mega-refreshing herbed salad with a garlicky lemon, sumac, and oil dressing. Now… A word or two on sumac. No: it’s not the poisonous kind. Poisonous sumac* you want to avoid, clearly, but edible sumac grows widely (and wildly) in many parts of the United States and is not only perfectly harmless, but is also perfectly tasty. There are three varieties -smooth, staghorn and dwarf- that are safe to eat. One identifying characteristic that they share is the bright red or brown hairy clusters of fruit that are about peppercorn sized and in an arrangement like upside-down clusters of grapes. You can gather them before a rainstorm (which washes away the lovely sour, citrus-like flavour), dry them, and grind them for your own FREE sumac, or you can do like I did this time and buy a bag of sumac from Amazon.com. Given that it won’t the the right season for gathering sumac for a couple of months, and we need salad THIS VERY DAY, I’d say buy the sumac. *For a while last week, I thought I might be allergic to sumac and it made me very sad indeed. As it turns out, I was allergic to a gin & tonic I had made with a new brand of gin. This made me very happy indeed because frankly? I could care less about that gin & tonic. Why bother? Well, I suppose you could skip it if you’re feeling REALLY cheap or doubtful, but your salad won’t be the same. I promise you this. Sumac delivers a punch of citrus that’s like lemon on steroids. That’s part of what makes this salad such a powerhouse of summer refreshment. Everyone who has had a proper Fattoush is nodding their heads in agreement right now. They’re also quietly wondering when I’ll bring up the herbs. Give me a minute, I have to address the subject of properly preparing your garlic for the dressing first. Back to the herbs! Whatever you do, don’t skip the herbs here. Mint and parsley are CRUCIAL to the overall flavour. If you haven’t had the salad yet, you might scratch your head a bit at me, but I wouldn’t steer you wrong. It doesn’t scream MINT or PARSLEY but I guarantee you that if you leave them out, the salad will fall flat. 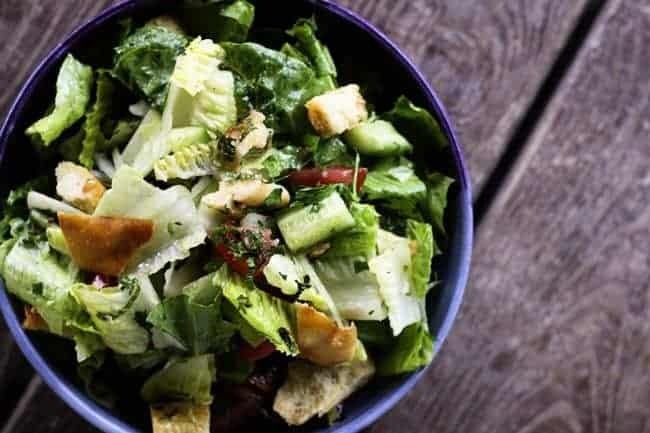 And while I’d usually rather lose a tooth to crunchy croutons than let them sit and soften in the salad dressing, that’s part of the charm of Fattoush -Crumbled Pita Chip Salad. The crunchy pita chips sit in the dressing and start absorbing the good stuff. If you’ve done a good job of dressing your salad -in other words, not drowning it in dressing- the chips will not become soggy, but will just become a little less jarring to bite. My favourite stage of pita chip softening is about one hour into the salad being dressed but I also love it as much as five hours after dressing. That makes this a fabulous salad to take on a picnic or for a packed lunch. Please make yourself some Baked Garlic Pita Chips and try this Fattoush -Crumbled Pita Chip Salad. 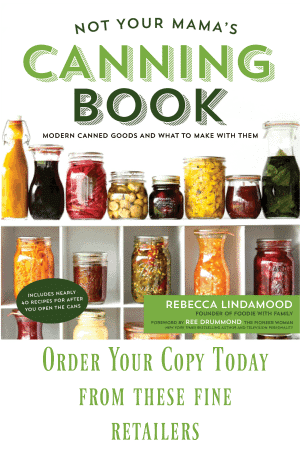 It will rock your salad world! Are you a crouton lover? Do you like ’em dead crisp or a little soaky? You’re going to want to make our Best Middle Eastern Salad Dressing to drizzle over this Fattoush -Crumbled Pita Chip Salad for optimal wow factor. You can get that recipe -full of the fresh brightness of lemon, garlic, olive oil, and za’atar- right here! A word of warning… start with less salad dressing than you think you’ll need. Toss, taste, and adjust if needed. It’s so much easier to add more dressing than to subtract too much! While it isn’t really important how the vegetables are chopped, it is best to try to keep the pieces of lettuce, cucumber, and tomato roughly the same size so you can fit little bits of everything in each bite. Finely chop the mint and parsley so that it disperses nicely through the Fattoush -Crumbled Pita Chip Salad. Three recipes for the price of one! 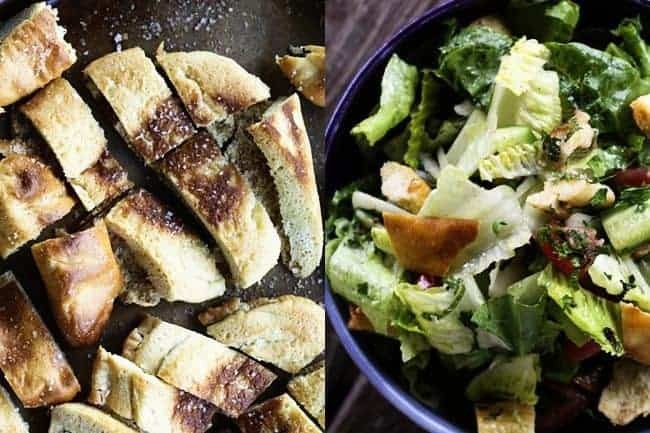 Fabulously crunchy Baked Garlic Pita Chips, super citrusy Fattoush Dressing, and wondrously herbal and lemony Fattoush (Crumbled Pita Chip Salad.) This trifecta of deliciousness will bring you refreshment and happiness through the hot summer months. Preheat the oven to 250°F. Cut the pitas into 1-inch thick strips. Lay the cut pitas in a single layer on a rimmed baking sheet. Brush the cut pita with the olive oil. Sprinkle evenly with the garlic powder and salt. Place the pan in the oven and bake , stirring every 15 minutes, until crisp all the way through and deep golden brown. Begin checking the pita crisps for doneness at about 45 minutes. Mine usually take an hour. Let cool completely. Store in an airtight jar at room temperature for up to two weeks. At least 10 minutes, but up to 6 hours* before serving, remove the core end of the Romaine heart. 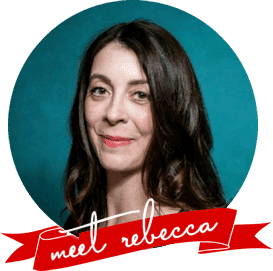 Slice the heart in half lengthwise, then turn 90° and chop across those slices to create bite-sized pieces of Romaine lettuce. Add that to a large mixing bowl. Add the remaining salad ingredients to the mixing bowl. Shake the salad dressing very firmly, pour about 1/3 of it over the contents of the mixing bowl and use your clean hands to toss to cover everything evenly. Let stand anywhere from 10 minutes to 6 hours before serving. Refrigerate leftovers. **As the salad sits, the pita crisps will begin to soften. At 10 minutes, they are still very crunchy. The longer it sits, the softer they get. My favourite point to eat fattoush is when it has been sitting for about 1 hour. This post was originally published May 13, 2013. Fattoush is further confirmation Jesus wants me to spend three weeks in Beirut. This salad looks soooo good!! Love all those flavours! You’re absolutely killing me with this. I’m totally craving it now. Oh wow – this looks amazing!!! I’m craving a HUGE bowl of this!!! What a coincidence, Robyn! I just ate a huge bowl. Shoot. I have no self-control around salad. Wow!! This looks so amazing!! I wish I was eating that right now! This is so my kind of salad!!! 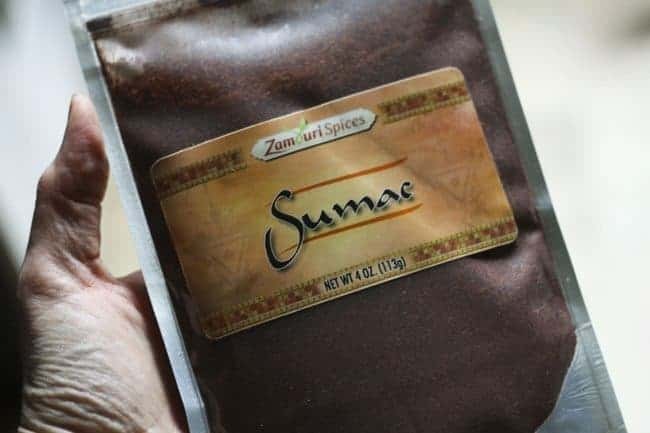 I have never had sumac, so you know now I have to order some. And I’m all about the crunchy croutons too (to balance out all the veggie goodness 😉 ) This looks fantastic, all of it. Help! My boyfriend loathes mint 🙁 He loves cilantro…I know totally in the same family which I say every single time!! Cilantro a reasonable substitute for mint here? Or just double the parsley? Hey Barrie- no mint? Tragic! I’d double the parsley. Feel free to experiment with cilantro, but I think it might be too assertive as a substitute… That’s just my gut instinct, though! This salad is perfect 🙂 love fattoush and this dressing looks amazing! I love that you love fattoush, Brandy! Salad is so healthy and there are so many different ways to make it (as I’m learning lately). I love this because it shows not only a great recipe but exactly how to do each step (like smashing garlic). I also have to say that croutons are one of my biggest problems with salad because they taste great but they are often quite bad for you. These pita chips look great and healthy too. All in all I’d have to say an excellent looking meal for me. I made Fattoush long ago and didn’t put the parsley and mint in. It was terrible. Yesterday I was at the mall and had some for lunch, that spurred me on to gather the ingredients and try again. This time NOT avoiding the parsley and mint. It not only tasted the same as the mall restaurant, it smelt the same. Heaven! The only mistake I made was the croutons, I will make them your way next time. As for the sumac, I got it at Bulk Barn. OK, I’ve read this through twice, where and when do you use the sumac? Is it an ingredient in Za’atar? I did make the salad dressing and it’s great. Haven’t made the salad and or pita chips yet, but they sound and look great too. Hi Gloria- I used to have the recipe for the Za’atar and dressing on this post, and I forgot to pull those photos. Here’s a link to the post that has the za’atar recipe in it. 🙂 The dressing can be found here!